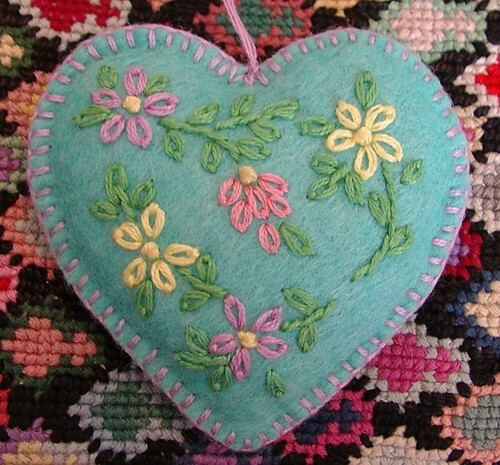 felt ornament heart, originally uploaded by sunshine's creations. If you are thinking of Valentine's Day and want a simple ornament or gift tag, you can always make one of these hearts; follow the last link to the tutorial. 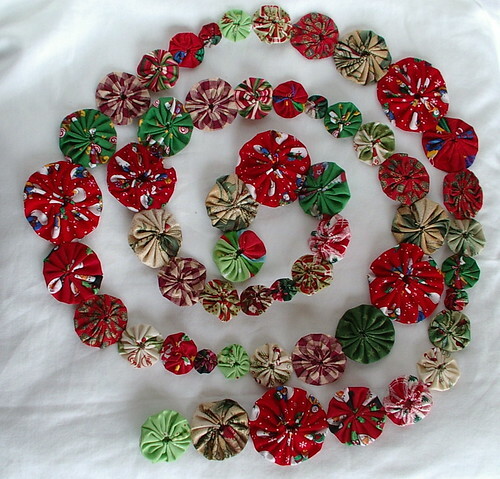 If you do make one, please feel free to join flickr felt creations group and add your photo; I would love to see them. This would be real cute with tatted flowers, too, instead of embroidered ones. I may have to try that. If you make a tatted version, join "the mad tatter" group on flicker and add tatting ones there. 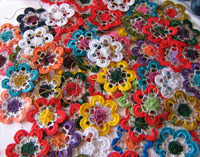 If you have no idea what tatting is, check out this site the 25 motif tatting challenge. My daughters were playing with my oldest Colorados the other night and decided to make a picture of my fairy girl (oldest daughter). They got a little bored waiting for grandparents to come and visit; they, the grandparents, were a little late due to unforeseen circumstances. A few days prior my oldest two daughters had a piano recital that the grandparents were not able to go to through no fault of their own. So they where coming over for a private recital from the girls. In the process of waiting, this idea came into my daughters' heads -- to make the oldest out of blocks. It is actually a real cool toy; I'm just not sure if I think that really looks like my daughter. 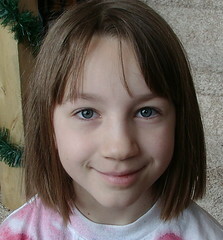 But at least the eyes are blue and the image has short hair like she does. I am just thinking she doesn't have a green nose and purple cheeks or bright red lips. I don't know what do you think (rhetorical question). That is when all this snow fell onto our back deck. We didn't haul any up the stairs; this was already there. The kids are excited to make a snowman. They received a gift of an instant snowman in a box at Christmas, and they have been waiting for one really good snow fall so they could make him on the deck ,so this is the day. 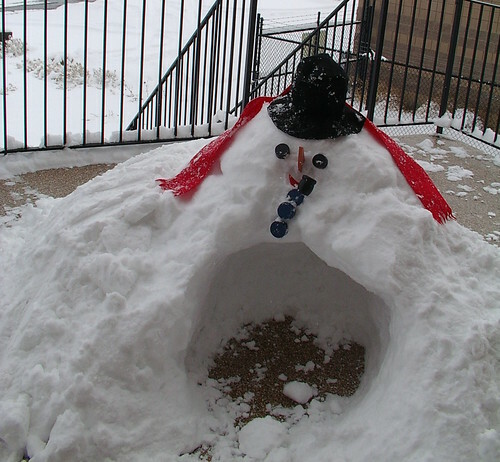 The instant snow man is pretty cool; he came with eyes, corn cob pipe and mouth, a carrot nose, buttons and scarf and hat. In the process of making this post I discovered there is a turkey in the box, too. How funny! 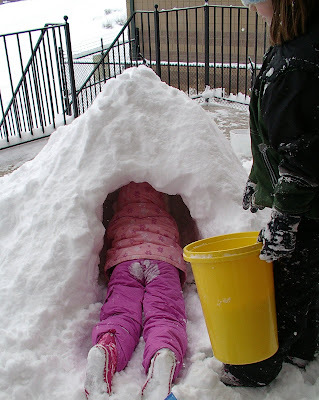 While I was posting, they changed their mind to make a snow cave instead. Funny because they have been waiting for almost four weeks to make a snowman. They made a snowman after all. He is sort of the Mount Rushmore of snowmen, I guess. Go figure, kids! They stayed out so long that their little bodies got so cold they couldn't feel themselves. 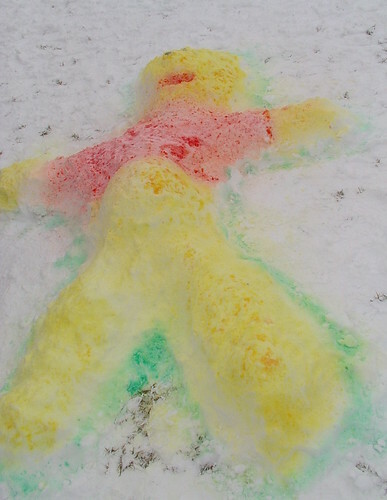 But, they made the snowman, so that is all that mattered. Aqua shirt now in store. These two shirts are now in the store. Hope to finish another and place in store later today. 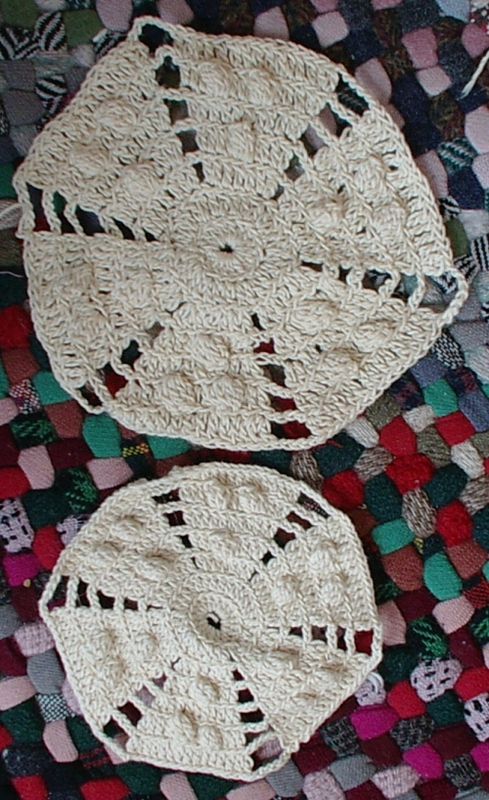 I have another antique afghan with this same pattern that has larger hexes. So I plan on making a few shirts for adults, too, in the near future. That one will be a little harder to take apart because of the way the blocks have been joined. So I was thrift shopping a few weeks ago and found this bag of what I guess was the start of a blanket, table cloth or table runner. I have seen the pattern before it comes from the 1930's-1940. So these are more than likely 70+ years old. What ever it was supposed to be it wasn't finished and it had no supplies with it. So I decided I would buy it and make something from it sad that nothing was done to finish it. 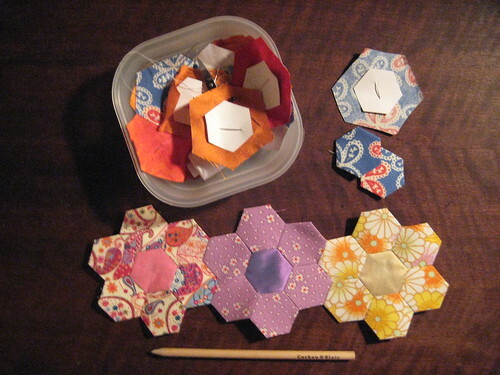 Since the hexes where already stitched into 5 pieces I had to disassemble to reassemble parts of it. 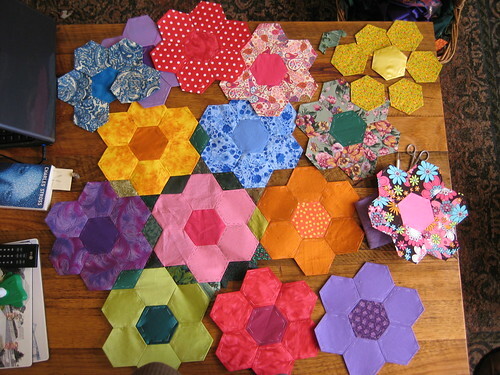 Total 70 hexes what I really wanted was 72 hexes but I figured that one out. So above is what I came up with. Well actually I have the start of three dresses. These when done will fit little girls between the size of 4-5. Two of the dresses have sleeves the last one will have cap sleeves as there wasn't enough of the hexes to make all three have full sleeves, I was two short so cap sleeves it is. 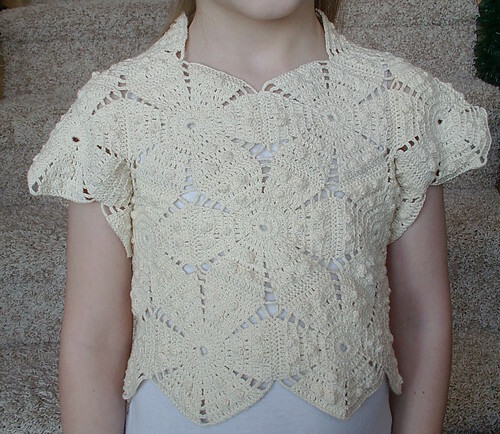 The sleeves look funny when not on a person but I had my daughter try it on and it looks fine on a little girl. 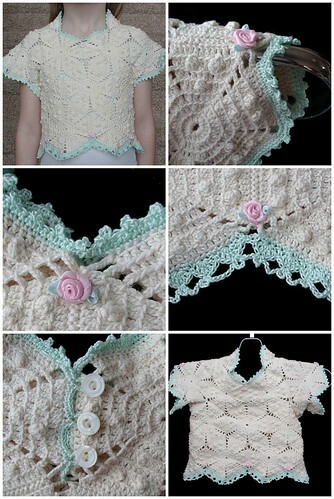 They will also have mother of pearl buttons on the back as a closure. Of course there will be satin roses or ribbons on these two when done. I plan on each having a different color skirt to go with it. So this way no two will be exactly the same when completed. I am kicking myself for not taking a before photo. 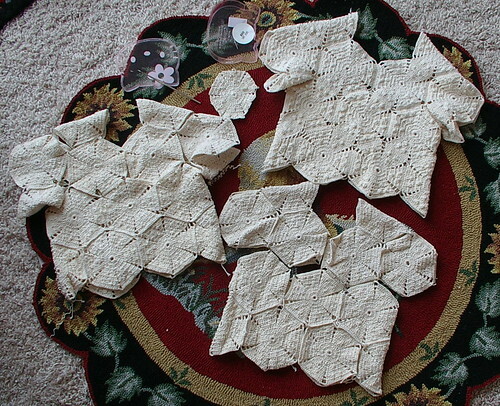 The top right photo is right side out the other two are still wrong side out as I am attaching the pieces together. I will probably put these in the store when I am done with them, As the size they will be will not fit my older two daughters and would only fit the youngest for about 4 more months. As these are all one of a kind dresses I won't get them in the store again when done. 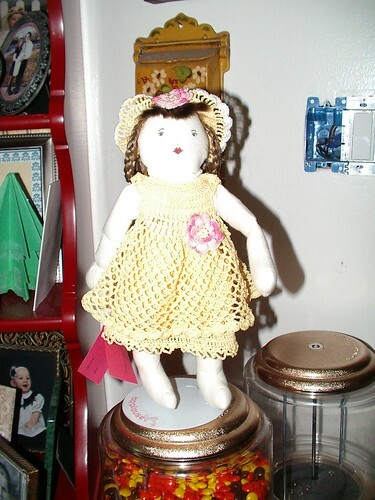 Below are two from awhile back of one I did for my daughter that was salvaged from a table cloth that had holes and stains I saved the good parts and made the bottom dress for my youngest daughter for Easter one year. Boy they are bad photos with an ugly green towel but the dress was nice. There was a question on another blog that I read, and I am trying to answer the post here with visuals. This is sort of how it would be used because I am right handed. This should really hang from my right wrist so it feeds directly into my hand that holds my hook; I can crochet lefty, too, just don't do it much. Anyway, because of that I use my right hand to take photos, too, so it is on my left in the picture. This is a wrist thread-ball holder. 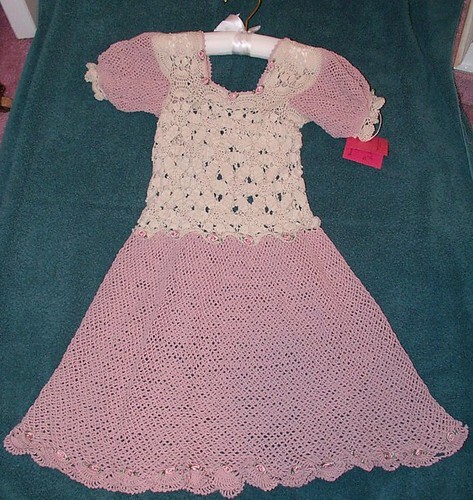 They where popular when crochet and knitting where in the height of fashion. 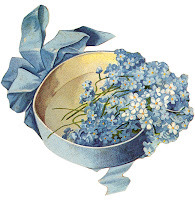 I have patterns for these from 1880-1920. 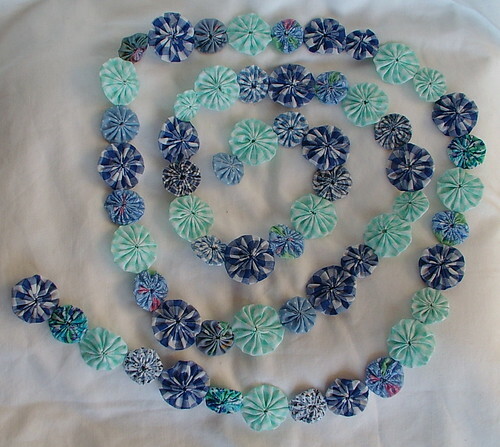 In the center is a cabone ring on each side (not always used). This is where the thread is fed through the item, so that when you are traveling your ball does not end up on the floor and get dirty. 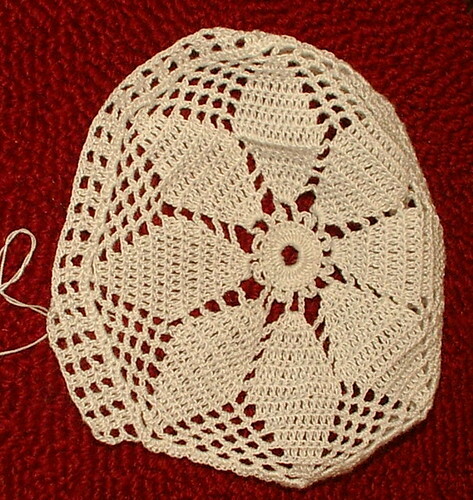 This was a common item in most ladies' traveling knitting/crochet bags. 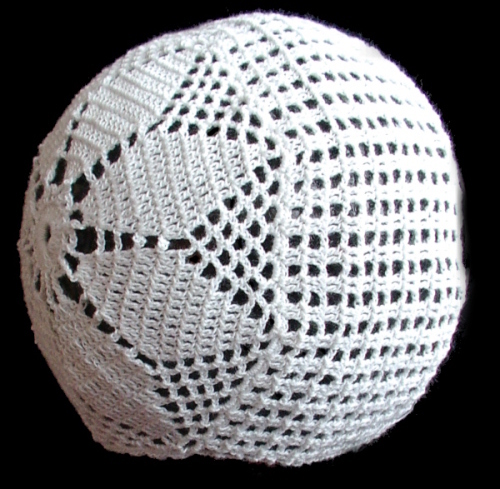 When a lady wanted to crochet, she would pull out the lace from the top of the bag and pull out her needle or hook that she had stabbed into the ball, and would start to work. 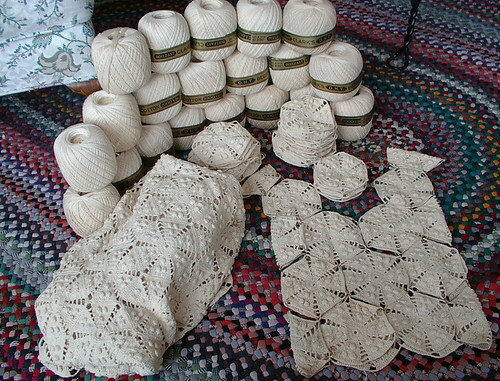 When done, she would place the lace back into the top of the bag and re-stab her ball with needle or hook. This is also a bag that tatters would carry and do the same thing with it, except they wouldn't stab their work, they would just place the shuttle inside the bag. 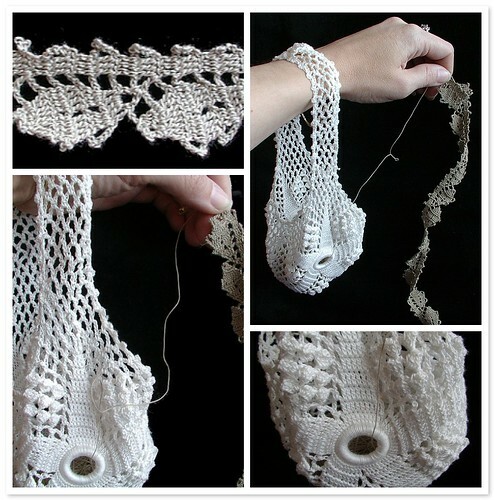 Of course, for tatting the ball bag would hang on the opposite wrist than it would for crochet. So when I tat, this is the wrist it hangs on. For any of these techniques it is best to use a center-pull ball, but it's not required. 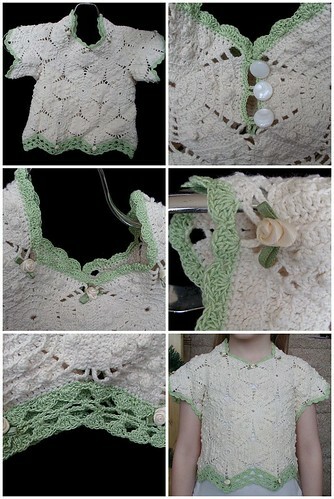 The bag pictured above is not antique; it is one I made from an antique pattern. 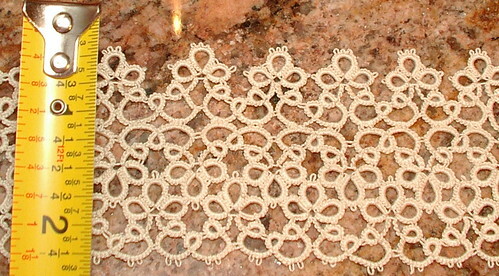 Coming out of this is a piece of lace I am currently making. 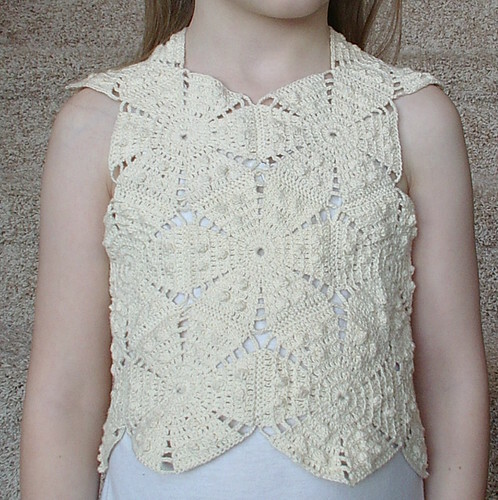 The pattern is from Leisure arts 111 Easy Edgings; in case anyone else wants to make it, pattern number 75. The hook size I am using is 10 this is roughly size 30 thread. 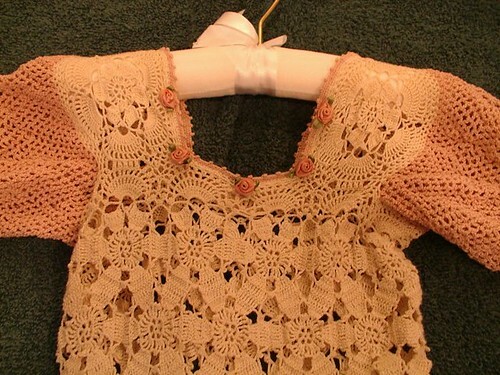 The lace is actually a light khaki color and is a boil fast thread, meaning it is vintage to antique thread. This is still in progress, but it is getting there. 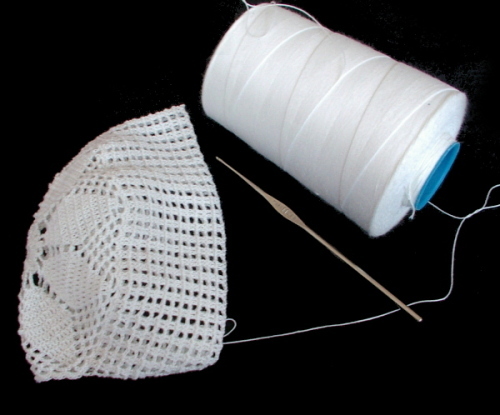 When I make bonnets in size 10 or 5 thread, they usually only take a few hours to make, about 3-5; size 20 & 30 thread, about 8 hours; size 100 thread, a very long time. 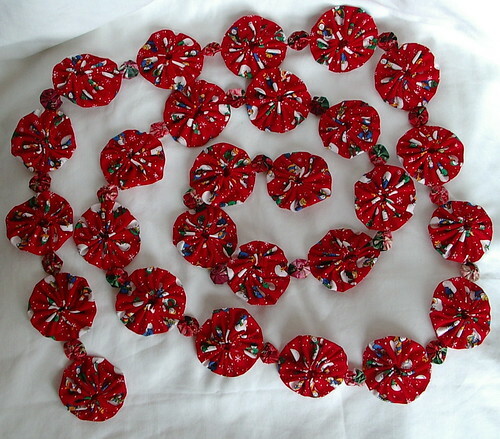 This one is made out of tiny thread that most people would sew with, not crochet with. 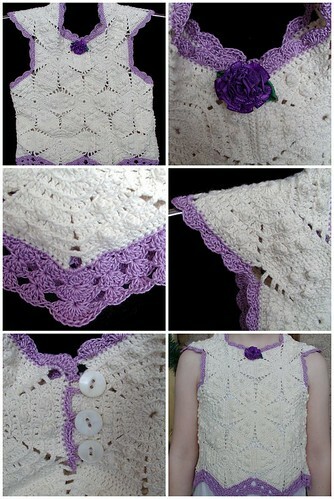 So far, it has about 12 hours of work in it, and I crochet fast. The thread is white; in the last post it looked cream, but that isn't the case. Still have the brim to finish, then add an edging and ribbons. Sorry about the weird colors, but blogger is doing weird things to my background. My background is supposed to be black, not white: this bites. I think blogger went on Holiday. update: A few people seem to like blogger's mistake, so I will leave it for a while and see if I like it. 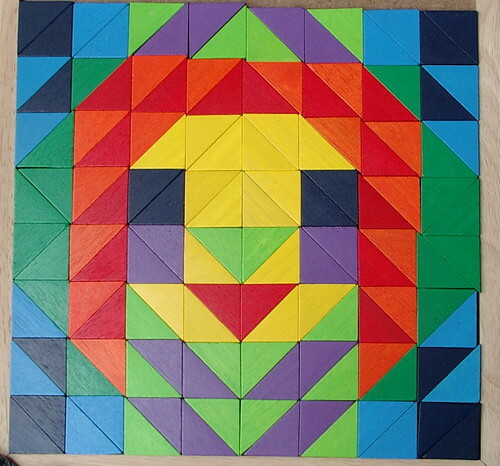 This picture was posted in The English paper piecing group on flickr. 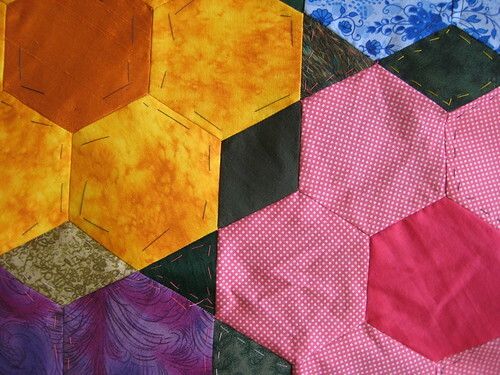 A discussion arose about how to baste large hex pieces. My tutorial explained it, but visuals are better. 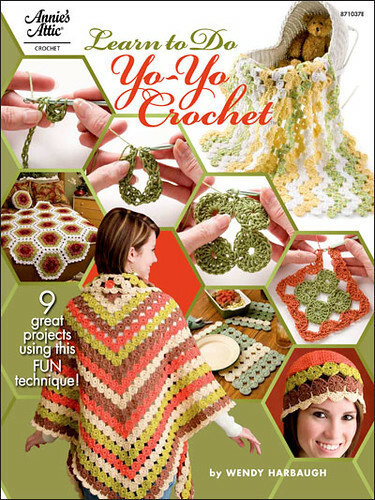 I do have permission to show this example of how not to do it by its maker, Anne Brumley. Pictured are her first blocks; I actually think they are well made. 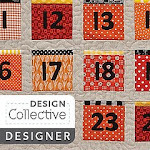 I do not see the stitching between the blocks, her fabric choices are vibrant and lively. I just want it clear that these are well-made blocks, and the only thing I wanted to clarify was all the basting threads. All the threads you see have to be removed; there are also lots of them, which makes that time consuming and your fingers will hurt from going through the papers so much with the needle. 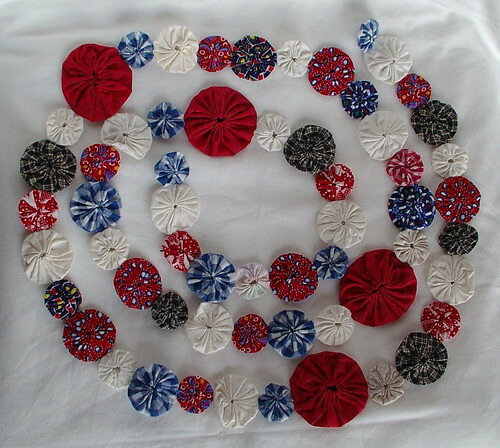 In the way I do it, all you have to do is cut six small threads; just six small nips of the scissors, then pull the papers out (which saves time) and just leave in the basteing threads. 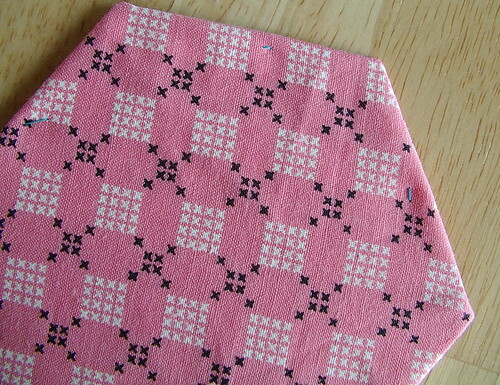 So, you do a back stitch in each corner where the fabric folds over on top of itself. 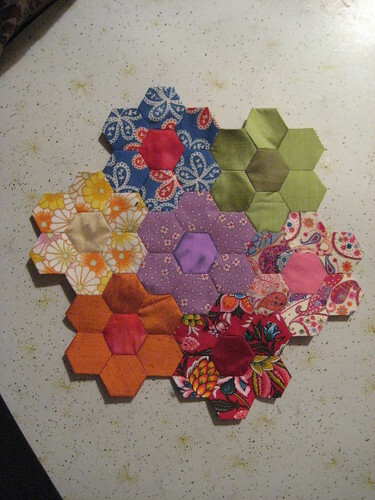 Then, in the middle of each side of the hex you do an ever so tiny stitch that goes through the fabric and the paper. I have made a few things with this technique, so I promise it is simple and not hard. 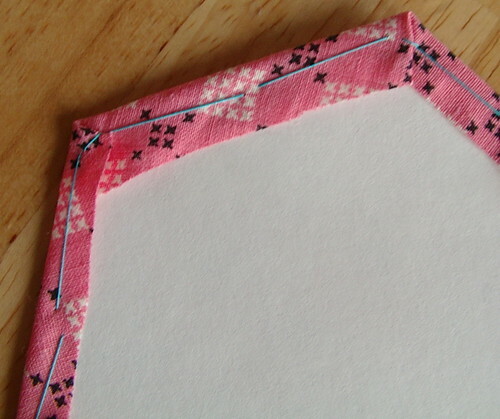 Go all the way around in this manner; cut thread when you get back to the beginning. 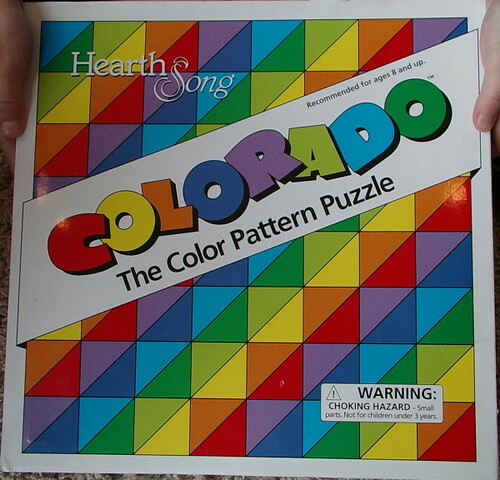 I hope this helps whomever does bigger pieces in English paper piecing. 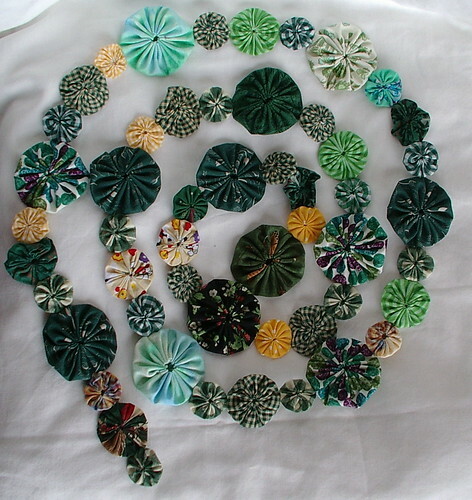 Below are other examples of Anne's work; she uses silk in some of her work, and it is lovely. 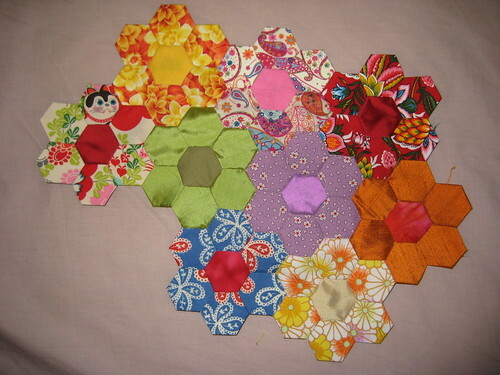 She picks very nice fabrics and has good hand piecing skills; she is a very nice hand seamstress. On Saturday I talked about how long all three of my daughters' hair was. 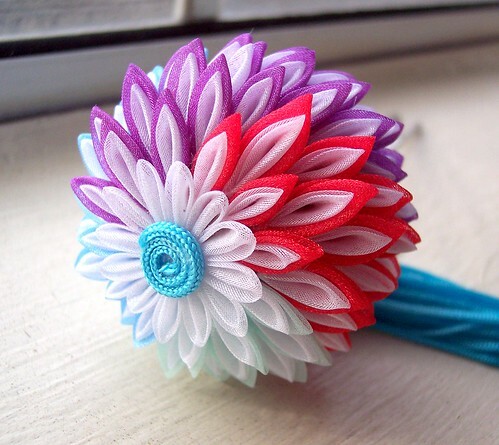 Also how I wanted to make Kanzashi for them. 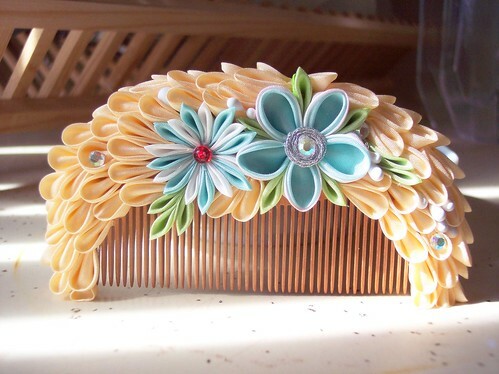 I still do, just one will have to be on clips instead of combs or hair pins now. Because, as of today, one of them no longer has long hair. She had the longest out of all three; it was below her waist, and she was starting to sit on it. It was getting a little annoying for her and hard for her to keep the knots out, with winter static and all. So we removed it (a good 18-24 inches original length, removed over 12 inches in length; look in the mirror in the right photo you can see the haircut is half done), so her hair is just above her shoulders, now. Sorry, I didn't feel good this weekend and didn't get that bathroom cleaned -- dirty mirror, oops. She is also embarrassed by this photo because this is her pajama shirt, and she never shows her shoulders unless she is in a bathing suit. 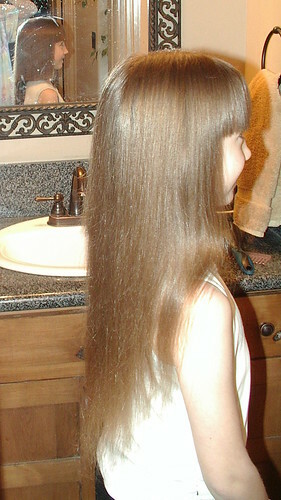 It is only on her because I am cutting her hair, otherwise no photo would ever be taken with her dressed this way. The last time I cut her hair I made the doll shown to the left. Yes that is real hair from my daughter on the doll. So now I have this stack of freshly washed and dried clean hair again, trying to figure out if I should make something again. 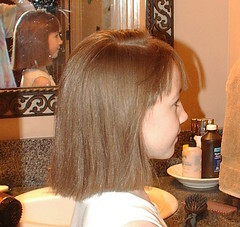 The reason is, last time I did something with it because that was her first haircut. Well, this is only her second one, and she is ten. Each haircut represents roughly half her life. So I am taking suggestions as to what to do. Currently, the hair is just resting in a metal tin 'till I figure out what to do with it. Photo at left taken in my old home. The room was being rewired; those are not live wires on that wall. 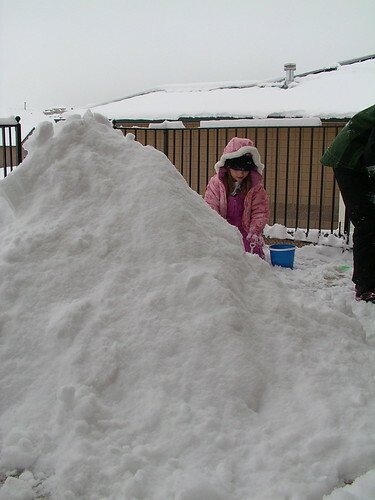 One of the two schools my kids go to has a snow sculpture day every year, one to two days after the first big storm. Well, that happened two days ago: 16 inches of snow fell at the school. So, today was sculpture day. 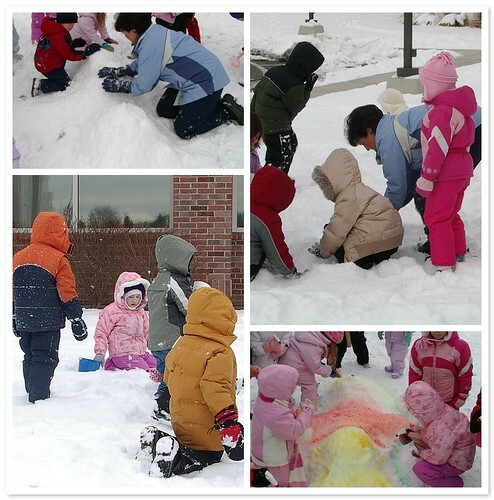 Each class gets to make snow sculptures. This is just the one from the K-grade that my youngest daughter is in. They have been reading about A.A. Milne and his story, Winnie the Pooh, so they thought it good to make Winnie the Pooh. 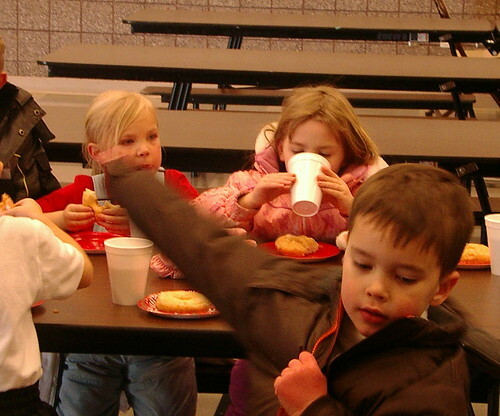 After all the fun and freezing our tails off, we went into the school's cafeteria, and hot cocoa and donuts were had by all. 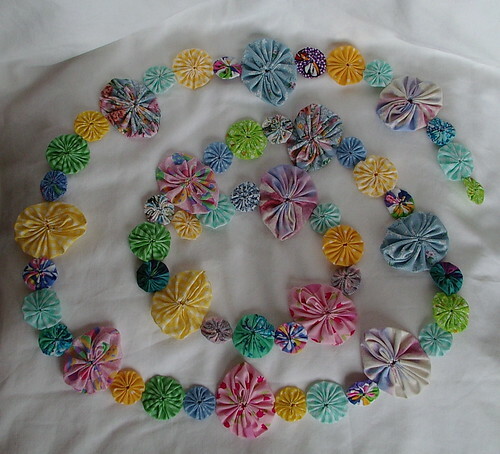 I have made a few garlands the last few days and they are in the store. 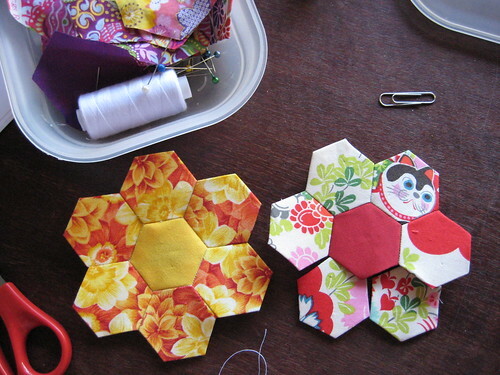 I am still making Valentine's and Thanksgiving; then I will go on to Halloween and Mother's Day. Those hearts for the Valentine one are taking me a little bit more time to make. 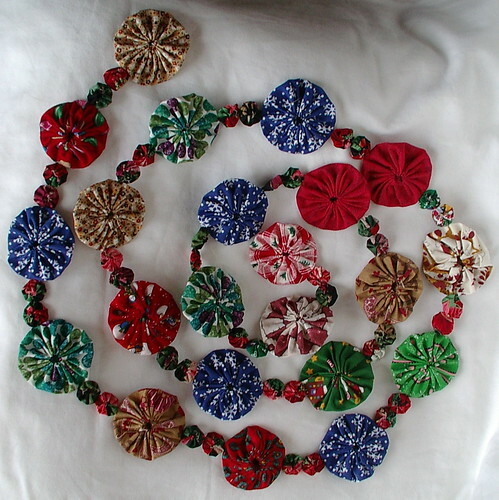 All of the garlands are a little longer than 2 yards a piece.